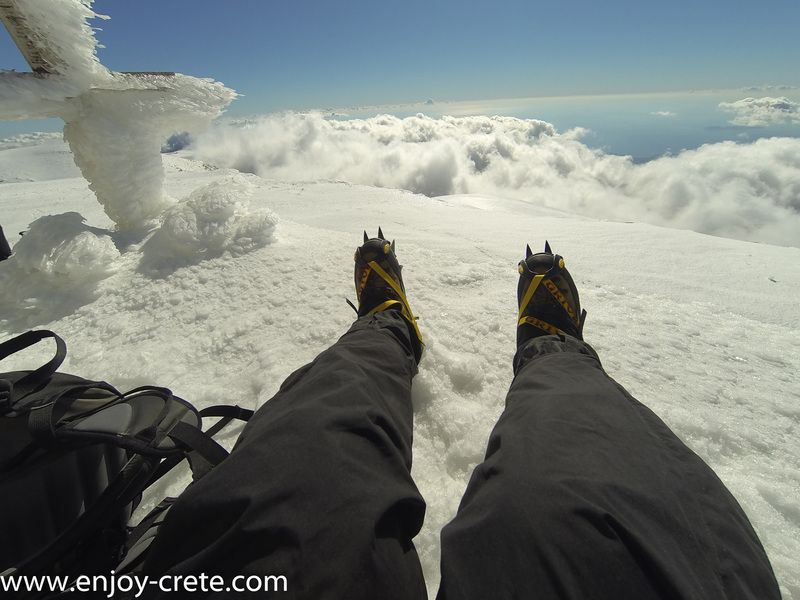 An ascent on the highest peak of Crete, Timios Stavros, at 2,456m a.s.l. on Mt Psiloritis. During the summer the temperature is always at least 10oC lower than sea level and is not uncommon to need a jacket even in July, August when everyone is laying on a beach! 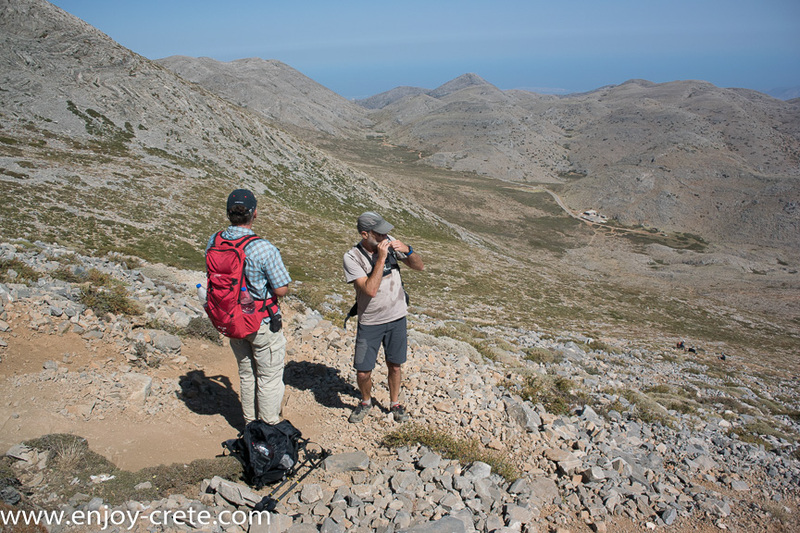 We start our hike from a place called Lakkos Mygerou, at 1700m, on the northern side of Mt Psiloritis (or Mt Ida). 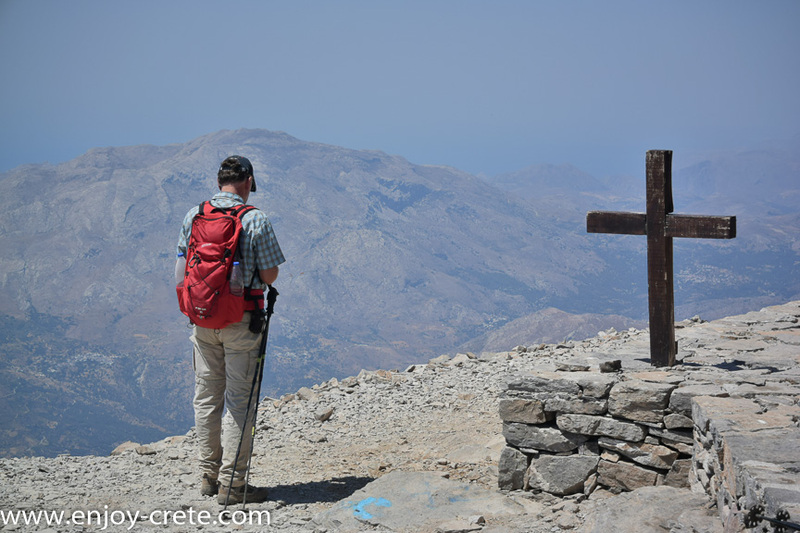 We follow an up going, stone-built, well-marked trail that in two hours meets the E4 European trail. 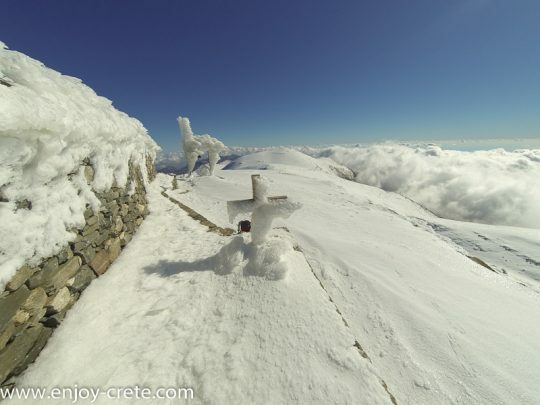 Following it we reach the highest peak, Timios Stavros, which offers a panoramic view all over the island. During the winter you need to have a good knowledge of using an ice axe with crampons. From December to early April usually the summit is cover with snow. 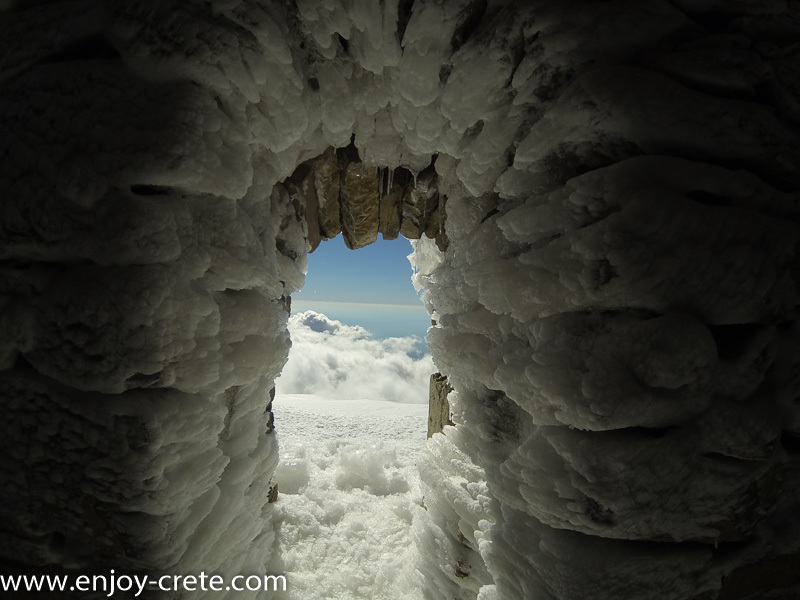 Located in the Rethymno regional unit, it was sacred to the Greek Titaness Rhea, and on its slopes lies one of the caves, Idaion Andron, in which, according to legend, Zeus was born. Its summit (Timios Stavros) has the highest topographic prominence in Greece. A natural park which includes Mt. Ida is a member of UNESCO's Global Geoparks Network. In his Histories, the Ancient Roman historian Tacitus reported a belief, popular in antiquity, regarding Mount Ida and the origin of the Jews, complete with conjectural etymology: "It is said that the Jews were originally exiles from the island of Crete who settled in the farthest parts of Libya at the time when Saturn had been deposed and expelled by Jove. An argument in favour of this is derived from the name: there is a famous mountain in Crete called Ida, and hence the inhabitants were called the Idaei, which was later lengthened into the barbarous form Iudaei." 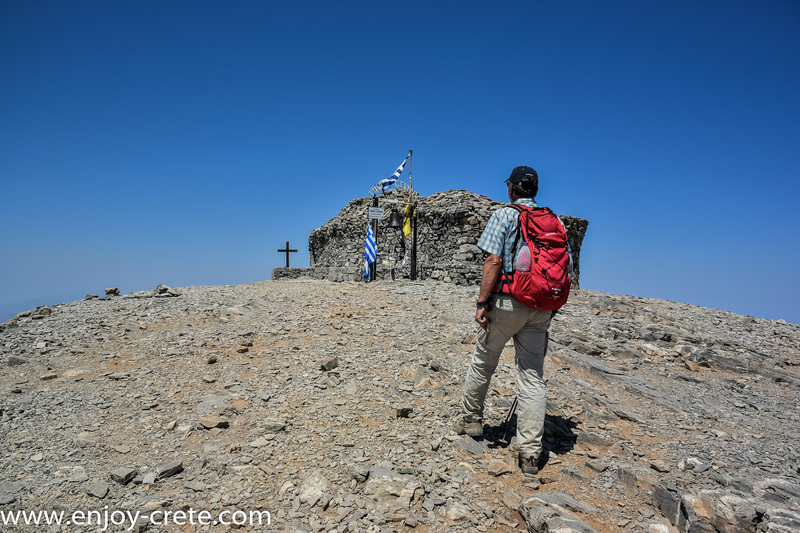 Inside the church of Timios Stavros, summit. We will meet in Mygeros shelter, click this link for the exact point. Be sure that you will put it in your GPS (Google maps have an offline version who works great without phone signal) and that you have an offline system in place (see previous note) as there isn't phone signal there. We start by 10 am. We pick up clients from Heraklion. Many times we are able to pick up clients from other locations as well but it needs to be on our way to the starting point. If you need transport and you are not sure get in touch with us. Remember to send us the exact location of your hotel, not just the name. Transport is provided for free. What will happen if there aren't enough participants? We do need a minimum of 2 to run this hike, if you are travelling alone will try to put you with another group. If we don't have any other bookings during your dates a full refund will be given assuming you paid the deposit to confirm the trip.